PARIS, France, Oct 24, 2016 – ESI Group, leading innovator in virtual prototyping software and services for manufacturing industries, announces their collaboration with global aerospace manufacturer Safran Nacelles. The aerospace company has recently deployed an R&D project to demonstrate how they can use ESI’s Virtual Reality solution IC.IDO to conduct process design reviews and validation, to set-up new manufacturing and assembly processes, and to deliver interactive maintenance training. The project has already delivered successful results for Safran Nacelles, who intend to roll out virtual reality within the entire company. ESI IC.IDO has proven its ability to deliver Safran Nacelles greater agility in their design and development process, while promoting collaborative and interactive work. In early 2015, Safran Nacelles launched an R&D program to evaluate the potential of virtual reality to improve their new product and process design. In order to incorporate innovative concepts and new materials, Safran Nacelles engineers needed a tool that could enable them to visualize and validate new manufacturing and assembly line set-ups, to conduct ergonomic studies, and to train their operators efficiently. Safran Nacelle’s site at Gonfreville l’Orcher in Normandy, France, hosts a design office, a materials laboratory, a Center for Excellence in composite materials applied to engine nozzles, customer support, and service departments. After a test phase and a 6-month benchmark during which the Safran Nacelle project team exchanged experiences with ESI IC.IDO customers at Boeing, Airbus and Renault, Safran Nacelles chose to adopt IC.IDO, running on Immersion’s virtual reality hardware. The first entity in the Safran Group to deploy virtual reality technologies on site, Safran Nacelles purchased a 2 sided “cave” and placed it at the heart of its design facilities. The system projects an image measuring 4 meters wide by 2.5 meters high. Since deploying the system on site in March 2016, Safran Nacelles engineers developed over 60 use cases. Their virtual reality (VR) room has become a true hub for local and remote users, and is used daily for collaborative design reviews. Engineers can easily discuss current design projects and swiftly detect errors early in the design process, thus avoiding bad surprises in later product development stages. The IC.IDO implementation of Virtual Reality enables users to see the 3D image of any given CAD part “real-size” and to interact with it in real-time. Engineers can test the reachability of parts, evaluate early feasibility for even the most complex maintenance operations, validate tool design, assess the ergonomics of a workstation, and simulate realistic operating conditions. “IC.IDO is profoundly changing the way Safran Nacelles engineers work: Virtual Reality reduces the need for physical prototypes and costly retooling, while promoting live team discussion to deploy optimum designs much faster than when working in silos.”, says Philippe JAMES, vice president Continuous Improvement and Risks at SAFRAN Nacelles. Today, virtual reality is a trusted process validation tool and is truly integrated in Safran Nacelles’ design and development processes, at an industrial scale. Thanks to this collaborative tool, engineering teams save time and get their parts right the first time. 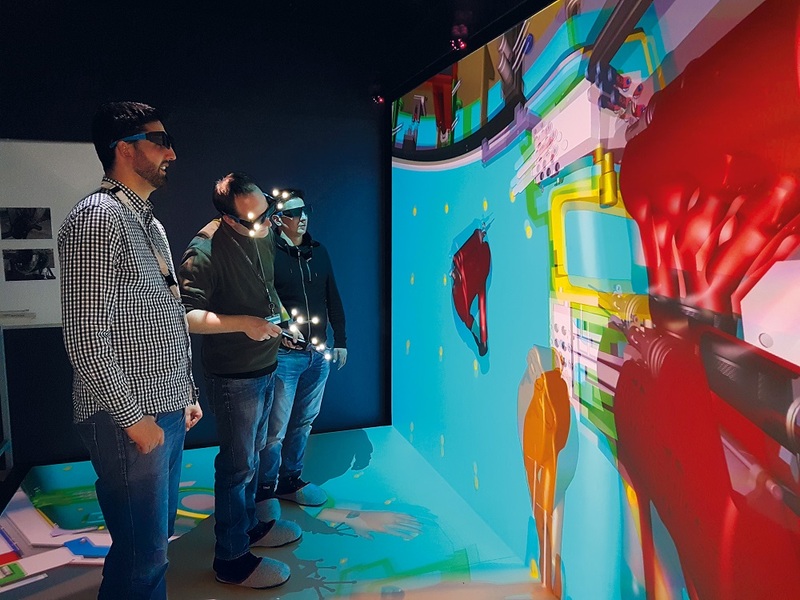 Ten champion users from different teams at Safran Nacelles have been thoroughly trained to ensure the fast integration of virtual reality at Safran Nacelles and to assure best practices for several use cases. As an added benefit, Safran Nacelles can now schedule remote and on-site collaborative process design reviews with their customers who use the same technology. For more information about ESI IC.IDO, please visit www.esi-group.com/icido. Join ESI’s customer portal myESI to get continuously updated product information, tips & tricks, view the online training schedule and access selected software downloads at myesi.esi-group.com. ESI Group is a leading innovator in virtual prototyping software and services. Specialist in material physics,ESI has developed a unique proficiency in helping industrial manufacturers replace physical prototypes by virtually replicating the fabrication, assembly and testing of products in different environments. Today, coupled with virtual reality, animated by systems models, and benefiting from data analytics, virtual prototyping becomes immersive and interactive: ESI’s clients can bring their products to life, ensuring reliable performance, serviceability and maintainability. ESI solutions help world-leading OEM’s and innovative companies make sure that their products will pass certification tests – before any physical prototype is built – and that new products are competitive in their market space. Virtual Prototyping addresses the emerging need for products to be smart and autonomous and supports industrial manufacturers in their digital transformation. Today, ESI’s customer base spans nearly every industry sector. The company employs about 1100 high-level specialists worldwide to address the needs of customers in more than 40 countries. For more information, please visit www.esi-group.com. This entry was posted in CAD-CAM-CAE, Featured News on October 24, 2016 by Sharmila Guha.